1816 year without a summer or one more reason why Ukraine is so important for everybody. 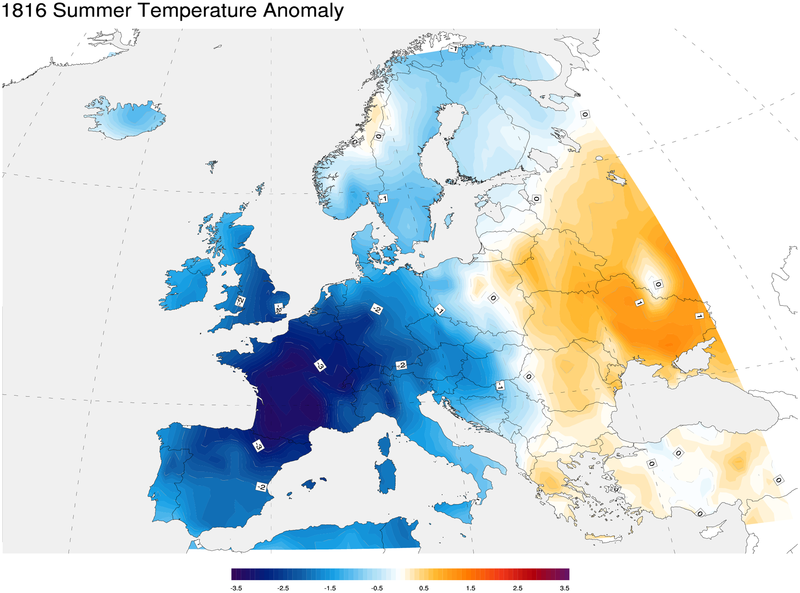 Between April 5–15, 1815, in the area Lesser Sunda Islands, Dutch East Indies mount Tambora erupted, throwing ash up in the air, which with combination of low solar activity caused a volcanic winter, that dropped temperatures by 0.4 to 0.7 °C , but parts of Russian Empire such as Ukraine and Volga region were spared and actually had a temperature increase. Lack of summer in 1816 created a wide food shortage in the Northern Hemisphere. In some part of Europe there were food riots. US and Canada had lakes frozen in July. I am not a meteorologist. In my life time I saw several big eruptions happened in Polynesia (one of them forced US to close Clark Air force base in Philippines) I do not know, if there can be another eruption like in 1815 soon, but all I can say, that there is something in the region of South Easter Ukraine and other places (see the map), that with rotation of the Earth keeps enough sunshine to produce crops, and other places cannot do that. This makes those areas strategic for countries to control food supply. Food – commodity that you cannot live without. Control food supply – control people and countries. Ukraine, specifically Central planes and South East of Ukraine, has one of the most fertile soils on Earth. By importance to food production, the land there can be compared to California’s Central Valley and Mississippi Valley. Some of the wars in the future will be for food and water.